Starbucks posted disappointing revenue numbers and lowered long-term guidance on its earnings call Thursday. Non-coffee beverages and food saw strong growth, saving the chain’s bottom line. Starbucks stock tanked 7% after-hours Thursday when the company reported disappointing revenue for the fourth quarter. Beyond the top-line miss, however, investors found some hope in the coffee giant’s earnings — especially in the non-coffee areas of its menu like food. The stock jumped 4.37% once markets opened Friday. “Our food program continues to grow and expand with food mix now over 21% for the first time ever in Q4, giving us confidence that we will reach our target of 25% food mix by 2021,” CEO Kevin Johnson said on the company’s earnings call. The chain has doubled down on its food offerings recently, and now offers everything from breakfast sandwiches to sous vide egg bites. Last year, the company announced it would add high-end breads and pizzas to its food menus through a licensing deal with Milan-based Princi bakery. This could follow the successful pattern Starbucks found in its La Boulange acquisition, which “helped transform Starbucks’ supply chain to a more consistent, national supply chain,” an analyst told Business Insider last month. Non-coffee refreshments — everything from Oprah Chai to shaken teas — are also quickly growing, Starbucks’ head of real estate John Culver said on the call. To be sure, the company still makes most of its revenue from coffee. Over half of Starbucks revenue last year came from beverages, a huge chunk of which it is safe to assume came from coffee. Wall Street now has an average price target of $US62.46 for Starbucks stock, according to Bloomberg data, roughly 10% above the $US56.27 level shares were trading Friday morning. 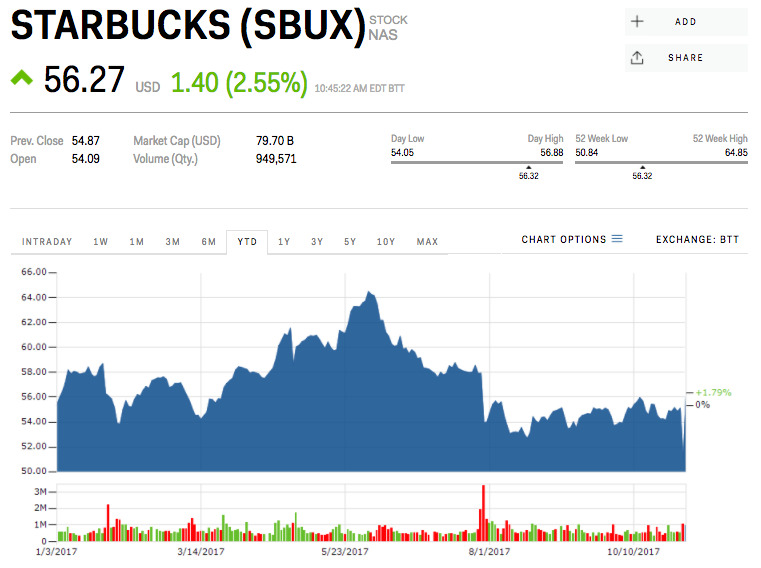 Shares of Starbucks are up 1.79% so far this year. Follow Starbucks’ stock price live here.